""Every Man's Dream" episode tie-in"
The Simpsons: Tapped Out "Every Man's Dream" episode tie-in content update was released on September 23, 2015 as a tie-in to the episode "Every Man's Dream", and is the one hundred and second content update, adding 1 new character, 1 new building and 1 new Springfield Heights decoraton. 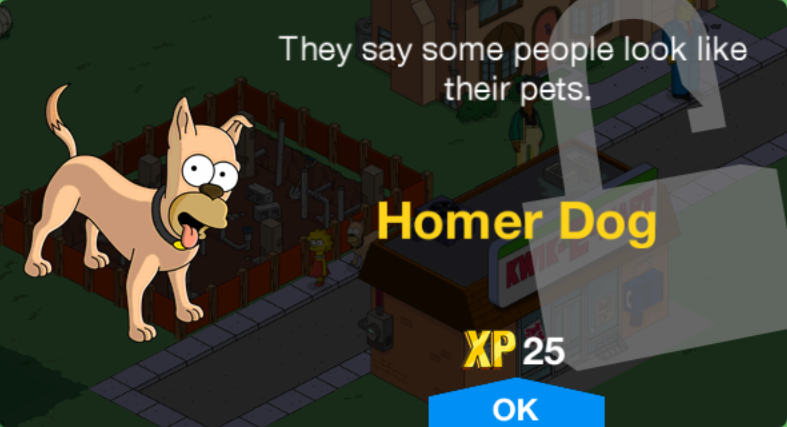 Homer Dog Unlocked after completing Narcoleps-ZZZZZZZ Pt. 7. Available till October 29th at 7am GMT. Oedipus Rx 2,500 24h Giving Nice Fills! Unlocked after completing Narcoleps-ZZZZZZZ Pt. 3. Statue of Burns 50 800,000 Available till September 29th at 7am GMT. It's 6 in the evening, Homer! Well, it's 9 AM somewhere. Hey, why did you say “vitamins” like it was in quotes? Because we “care” about you. Homer, were you sleeping again? Oh great, another lecture from Mrs. I-Only-Sleep-Once-A-Day. Mrs. I-Have-a-Special-Outfit-Just-For-Sleeping-In. Would you like a pillow for your head while you do it? Please Homer, I'm just worried about you. Maybe you should see a doctor. Okay. But I'm only going for the lollipop after. I'm sorry. I was just so tired from all the sleeping I was doing earlier. I think Dad might be narcoleptic. Not like Flanders -- he's totally a snitch. No Dad, it's a medical condition. You really should go see that doctor. Well, I'm not doing both. What's closer, the hospital or the pharmacy? The pharmacy hasn't been built yet. Well, build it close. In the meantime I'm going to take a nap. 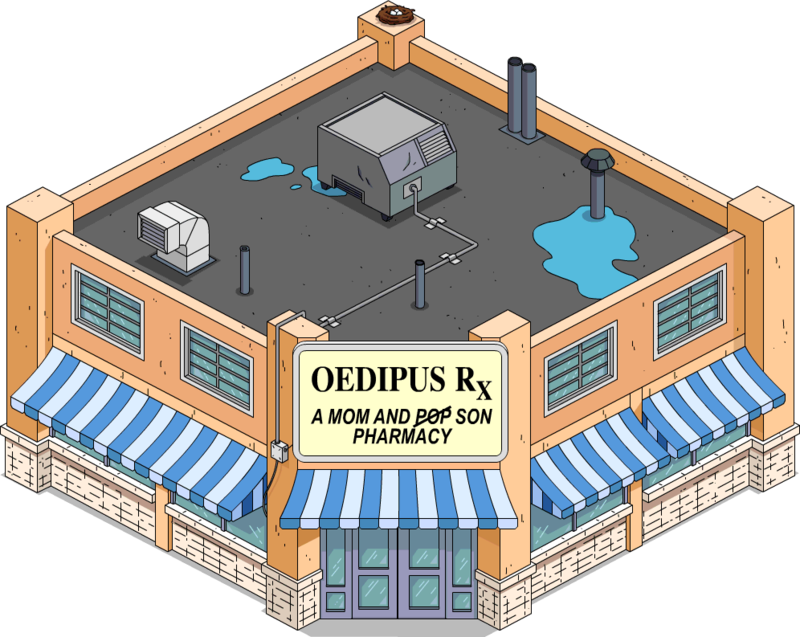 Hey pharmacist, I'm here to pick up some “vitamins” for my angelic son... by which I mean ADD meds to keep him from setting fire to things. One lazy parent's special coming up. Okay. Just sign your name here. My whole name?! How about just my initials... and let's pretend I have no last name. Okay. Have your son take one of these each morning. Side effects include staying awake, decreased appetite, and diarrhea. Staying awake, huh? So these could cure my narcolepsy? And my fatness? And my constipation? Wow, Bart's medicine kept me awake all day AND made me super-productive. It only took me thirty minutes to shop at the Kwik-E-Mart. And eight hours to do a sixteen hour plant shift. And twenty-two and a half seconds to play with my myPad! I got twice as much done today by taking just one of these pills. Which means if I took ten of them I'd do eleven times as much work! Or 1024 times as much, if it's multiplicative instead of additive. I feel great! It's all so amazing. I can see colors! Aw, you're such a handsome fellow. I just want to rub your belly! Wha--?! Are you talking to me? No buddy, she's talking to me. Oh man, this is great! I feel so productive! I'm in the perfect state of mind to work at the nuclear power plant. The pill bottle even said something about operating heavy machinery. Mr. Burns, you look different. Did you get a new haircut? Another liver spot? A glossier patina? I'm not Mr. Burns! I'm the manifestation of all your fears and insecurities. I might look scary, but follow me and I will show you enlightenment. Pfft. I'm not going to take orders from a figment of my imagination. You work the gut. I'll pee on his leg! Jeez, Homer looks like he's in pretty rough shape. You think we should do something? Nah, I heard that waking up somebody in a drug trance is bad luck. I heard if you die while you're on drugs, you die in real life! System Message A giant idol of Mr. Burns is now available in the store! See what the birds think of this monolith. Those pills really knocked me for a loop. But it WAS the most productive trip I ever had. Did I dream I was talking to a dog with my face? Man, that was crazy. Tell me about it. I dreamt I was talking to a man with my face. This has been a weird day, even by my standards. But at least no one got hurt. Bart went into a seizure from not getting his medicine. Oh. But he's not hurt now, right? System Message Tune in to this week's Simpsons to see if Homer really is narcolepsy free. Sunday 8/7 Central on FOX! A monolith to my magnificence, for all of Springfield to idolize. All employees, come see how good I look in gold! Hmm, wretched fowls and their lack of regard to excrement placement. 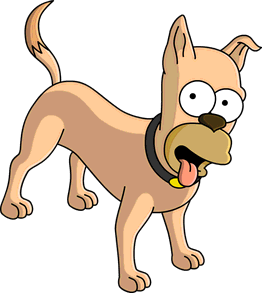 Smithers! I demand that you wipe these useless pigeons off the face of the earth by supper time. Ah, sir, I'm not sure that's actually possible. Well, quit dilly-dallying and find a solution. An entire species of birds isn't going to eradicate itself. It's done, sir. The pigeons are all... uh... gone. Well done, Smithers. These crows are starting to become a nuisance around the plant, however. Perhaps after dinner you can work your magic like you did on those blasted pigeons. Manjula and Akira were added to the people that can Shop at Kwik-E-Mart. Matt Groening, Artie Ziff and Manjula were added to the people that can Jury Duty. A new decoration for Springfield Heights, Statue of Burns, was added. Land Expansion icon won't appear on the Edit mode anymore, only on the Build Menu. The option to buy plots also shows up in Edit mode. Modified on June 5, 2018, at 03:17.